The Lummi Nation is trying to mop up thousands of escaped farmed Atlantic salmon, and the Swinomish tribal chairman has called for a shutdown of the industry as the fish reach the Skagit River and Alki Point. The Lummi Nation is marshaling a mop-up of thousands of fugitive Atlantic salmon in the tribe’s territorial waters, and the Swinomish chairman has called for a shutdown of the farmed-salmon industry in Puget Sound after last weekend’s spill. Swinomish fishermen caught farmed Atlantic salmon in the Skagit River on Wednesday night, as the fish continued to disperse through the Puget Sound, said Brian Cladoosby, chairman of the Swinomish Indian Tribal Community. He also received a report of an Atlantic salmon caught off Alki Point on Thursday afternoon. The fish were thick at Lopez Island Thursday, where fishermen out for smelt instead hauled in Atlantic salmon, and the fish were jumping in bays and coves all around the island. “These fish are headed to every river in Puget Sound,” Cladoosby said. “We have been saying all along it was not a question of if, but when, this would happen. Meanwhile, the Lummi Nation has declared a state of emergency and is paying fish buyers to take the Atlantic salmon brought in by their fishermen, said Merle Jefferson, director of natural resources for the tribe. Jefferson declined to say how much the tribe is paying. “It is not going to be cheap, that is all I can say,” he said. “It’s just like an oil spill, we are trying to contain it as best we can.” He said the tribe would be testing some fish for disease, and freezing the rest. With wild salmon runs already depressed, the tribe does not want native fish subjected to competition for food from the Atlantic salmon or potentially exposed to disease, Jefferson said. The farmed Atlantic salmon also have made their way into the Nooksack River, where Lummi fishermen have had treaty-protected fisheries for generations. The tribe felt pressed to pay buyers to take the fish because some fishermen have had trouble selling them. The fish were treated a year ago for yellowmouth, a bacterial infection, and some of the fish also have deformed mouths. It is not uncommon for farmed fish to have deformities because of living in confined conditions in pens, noted Ron Warren, assistant director at the Washington Department of Fish and Wildlife (WDFW). The disaster occurred over the weekend, releasing thousands of farmed Atlantic salmon, an invasive species, into Puget Sound waters from a fish farm owned and operated by Cooke Aquaculture Pacific at Cypress Island. There were 305,000 fish in the pen that collapsed. The company still has no count of the number of escaped fish, but company spokeswoman Nell Halse said Wednesday it is a far greater number than the few thousand initially stated by the company. Neither the company nor the WDFW made any public statement about the accident until Tuesday afternoon, when the state’s response was to urge fishermen in a news release to go fishing. The department Thursday afternoon asked fishermen to report their catch online to help the state get a handle on how far the fish are dispersing. Douglas said he will not serve farmed salmon in his restaurants because of his concern for effects on wild fish, and the need to build a robust market for wild fish. Cooke has been working to contain the fish by attaching netting to the remaining structures of the damaged farm, which contains ten net pens, Halse wrote in an email to The Seattle Times Thursday night. Workers also removed pieces of the destroyed structure, including lines and floats and other debris for disposal, Halse said. The company attached anchor lines to further secure the structure and hired a tug on standby Tuesday through Friday as a precaution should the structure – what’s left of it – drift. A crane barge will arrive Friday, Halse said, to lift nets to the surface and transfer what fish remain in the pens to a tender, using vacuum pumps. Some 40 fishing vessels were also catching fish along the shoreline of Deepwater Bay Wednesday, and Cooke sent its own employees out with beach seines, catching 228 Atlantics in all so far, which the company gave away. The company opened up some of the fish to determine what was in their stomachs and determined they were empty. Washington is the company’s smallest U.S. operation, with 80 employees. The disaster comes as the state Department of Ecology, which considers the spilled fish a pollutant, is working with a variety of partners to update the state’s regulation of fish farms, some of which date to the 1980s and “need to be modernized,” according to the department. 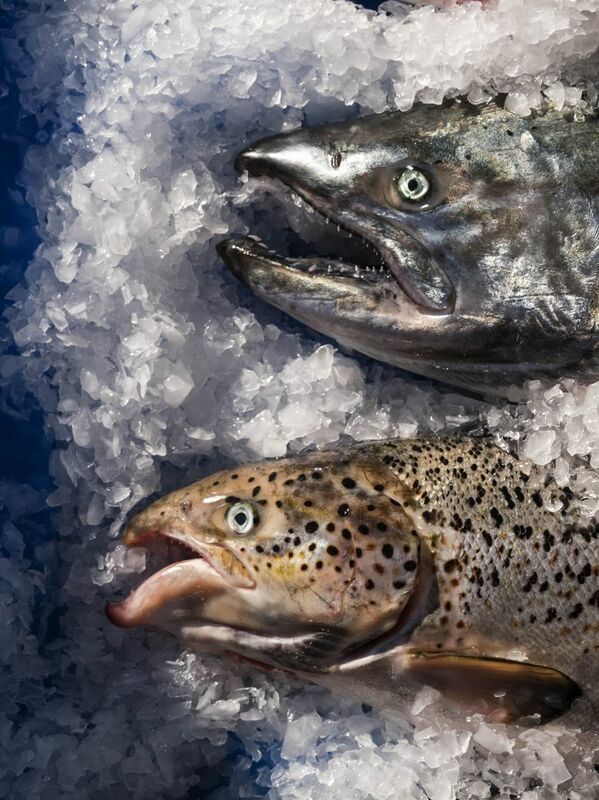 Washington is the only West Coast state with an open-water Atlantic salmon farming industry. Alaska and California ban such operations, and while Oregon does not disallow them, none currently operate in the state. Cooke Aquaculture is the largest producer of farmed Atlantic salmon in North America, with operations in Washington, Atlantic Canada and Maine, in addition to its salmon farms in Chile and Scotland. Norway is by far the largest producer of farmed Atlantic salmon in the world, followed by Chile and the United Kingdom, industry statistics show. Market demand for farmed salmon exceeds supply: the Port of Seattle is importing twice as much Atlantic salmon filets as are locally provided in commercial pens in Washington, according to the Department of Ecology. Ecology began its review of the industry in fall 2016 and wants to finish it by spring 2019. The findings are intended to guide industry, tribal governments, state and local policymakers as to whether regulatory changes are needed for commercial Atlantic salmon net pens operating in Puget Sound, Willapa Bay or Grays Harbor. Salmon farms are controversial in British Columbia, where the industry is far larger than in Washington. Activists released a film this week that shows penned Atlantic salmon swimming in their own waste and wild herring trapped in the pens. 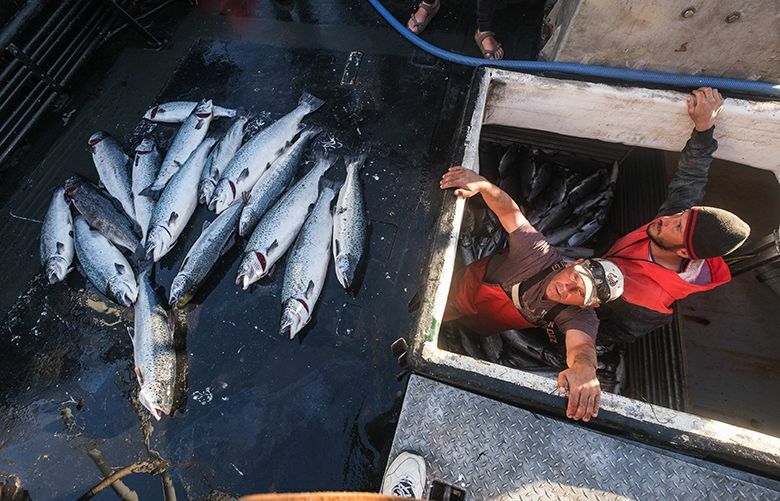 A proposal by Cooke to expand its operations in the Strait of Juan de Fuca is also meeting opposition from wild salmon conservationists, who plan a protest flotilla Sept. 16 in Rich Passage of Bainbridge Island. There are eight commercial Atlantic salmon farms operating in Washington waters, all owned by Cooke, which bought the operations a year ago from Icicle Seafoods. Washington is no stranger to farmed-salmon escapes, with several escapes in the 1996, 1997 and 1999, that resulted in the escape of 107,000, 369,000 and 115,000 Atlantic salmon, respectively, according to a Washington Department of Fish and Wildlife report. The scientific evidence available before summer 1998 suggested escaped Atlantic salmon were not colonizing local watersheds and were not significantly impacting native fish. However, in 1998 and in 1999, naturally produced Atlantic salmon were discovered in streams on Vancouver Island, B.C., according to the report. The Lummi Nation is not taking any chances as it seeks to pull up as many of the Atlantics as possible. The tribe is working to bring its fishery back even to 1985 levels, Ballew said. “This definitely does not help that goal. He said neither the notification of the tribe of the spill nor the response to it were adequate. “We heard about it from our fishermen first, and the response time to the spill is inexcusable.